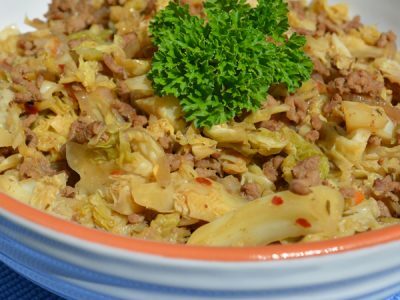 Beef and Savoy Cabbage Hash is a great Monday recipe that can be made using leftover cabbage from your Sunday roast, sort of like a bubble and squeak, although this is a serious low cal, no carb dish. I previously made this recipe as part of an HCG weight loss program, but I find that it makes a very tasty dish and has little fat and no carbohydrates. You can always add mushrooms and and other veggies to it if you want to pack it out a bit more. In a good sized frying pan, brown the minced beef over a medium heat. Pour the beef into a sieve and rinse through with hot water to remove fat, then wipe out the pan with kitchen roll. Return the rinsed beef to the pan and season with the cumin and a bit of salt and pepper, then add the garlic and onion and dry sauté for a few minutes. Add the savoy cabbage and the broth, chili flakes, cayenne and Worcestershire sauce then cook until the cabbage is tender adding more water or broth if necessary. Taste, then season with salt and pepper if needed then let it cook down until no liquid is left or leave the liquid in and have it as more of a soup. Pour it into a bowl and enjoy and if your not seriously dieting serve with a nice slice of toasted crusty bread!